Exciting news! 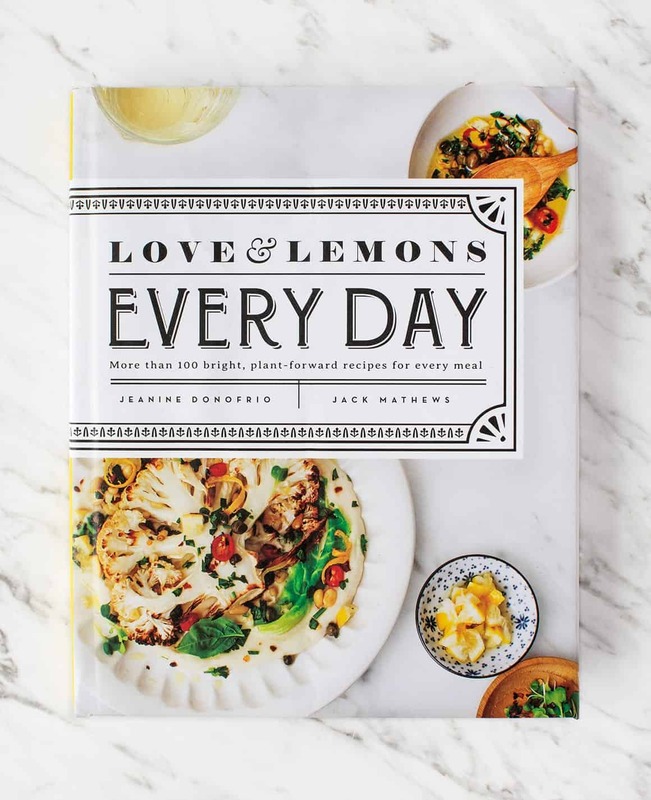 Our new cookbook - Love & Lemons Every Day - comes out soon! It’s packed with over 100 all-new vibrant recipes for every meal. I’ve been keeping this a secret for a while now, but today’s the day that I can finally tell you about my new cookbook, Love & Lemons Every Day! The main thing that I want you to know about it is that, well… it’s packed with all of my absolute favorite recipes, ones I’ve been obsessively making, eating, serving, and testing nearly every day for the past three years. It’s a big fat beautiful book packed with all-new vibrant veggie recipes (none are on the blog – you’ll only find them in the book) and lots of beautiful visuals to inspire you to make fun, delicious food. It’s coming out April 2nd, and you can pre-order it now! My approach to this cookbook was very different from the first book. With the first book, I focused all of the recipes on my farmers market finds, and I based dishes solely off that inspiration. With our recent move closer to my family in Chicago, I decided to change things up a bit. With Chicago’s farmers market season being much shorter, as well as having more meals with my extended family, I shifted the focus of this book more towards everyday cooking with vegetables that you can easily find – whether you’re shopping at the grocery store or the farmers market. Of course, the book is full of recipes featuring gorgeous produce, but it’s organized by meal type, so you’ll easily find something yummy to make any day. This means more meals that your whole family will love with vegetables at the center of the plate. So, what’s in the book? 100+ all-new vibrant recipes that make vegetables insanely delicious! Love & Lemons Every Day is the perfect book for making any meal, from breakfast to dessert, where vegetables (and/or fruits) are the star. Butternut squash becomes the best queso you’ve ever eaten, broccoli transforms into a zesty green “rice” burrito filling, and sweet potato blends into a smooth chocolate frosting. The book is organized by meal type, including Breakfast, Snacks & Starters, Salads, Soups, Side Dishes, Desserts, Drinks, and Homemade Extras, but the biggest chapter by far is Dinner! Because, when I personally read cookbooks, I’m usually looking for something inspiring to make for dinner, and I wanted to give you lots and lots of plant-forward main dish options. 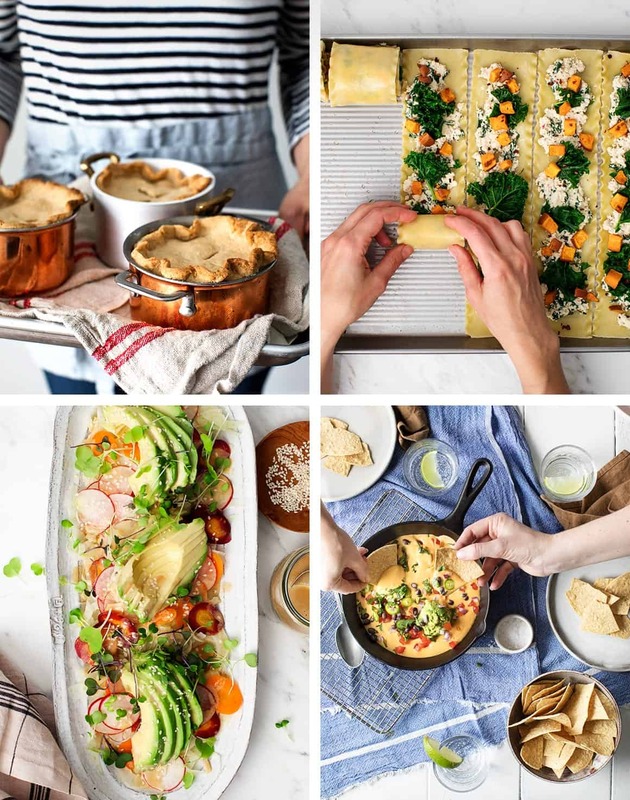 And speaking of plant-forward options, all of the recipes are vegetarian and nearly all of the recipes have a vegan alternative if the recipe is not vegan already. There are a good amount of gluten-free recipes as well. If you have our first cookbook, you’re probably familiar with the hummus, smoothie, and pesto charts that are at the back of the book. Everyone loved those (including me! ), so I made more! Sprinkled throughout the book are visual charts and guides to show you how to make my favorite kitchen staples. Learn how to roast or grill any vegetable, how to make vegetable stock with whatever you have on hand, and more. Tired of your usual desk lunch? A giant grid of 5-ingredient salad dressings will have you devouring a new salad every day! All the dressings are wonderful to have on hand for throwing together quick meals. You’ll have a great time discovering other uses for them as well. Of course, the dressings are great to pep up your greens, but you’ll also love them on grain bowls or drizzled over roasted vegetables. As I created these dressings (and had a million dressings hanging around my fridge), I had tons of ideas of how to mix and match them to create new recipes. I hope these informative graphics spark that kind of kitchen joy for you too. Sometimes you just need a quick, tasty combination of healthy ingredients. If you’ve been reading the blog for a while, you’re familiar with our Many Ways posts, such as Overnight Oats Many Ways and Stuffed Sweet Potatoes Many Ways. These ‘many-ways’ style concepts (new ones!) appear in the book, too! You’ll see 6 Ways to Scramble, 5 Easy Pasta Favorites, and Fruit Crumbles 4 Ways. Sometimes you want to pour a glass of wine and spend quality time in the kitchen. This book features an array of more involved recipes for those days. Try the Cozy Vegan Mushroom White Bean Pot Pies, Zucchini Verde Vegan Enchiladas, or explore a collection of special occasion menus. Not sure what to do with your beet greens and broccoli stalks? I’ve included a section filled with fun ways to use scrap vegetable parts in your everyday cooking – waste not, want not! Nearly every (easily accessible) vegetable under the sun is featured. Cauliflower and kale are here, but you’ll find tasty ideas for less popular veggies like parsnips, rutabagas, and collard greens, too! Some of my favorites include a hearty meatless rutabaga ragu and a collard green slaw that’s perfect to pack for lunch. I truly hope you love this book as much as I loved making it for you! Click one of these links to pre-order the book! So exciting! I cannot wait! I am actually making your butternut squash cauliflower coconut curry tonight for dinner. I have made it a couple times now and everyone loves it! Can’t wait! Love your blog and your first book, after getting it out of my library several times, I finally ordered my own copy. Can’t wait to get this one too! Just to confirm and double check, ALL Vegetarian yes? I see “plant forward” and vegetarian but just double checking. I’ve so had it with sorting through meat recipes. Hi Jenny, Yes! It’s entirely vegetarian and nearly every recipe has a vegan option. Yay You and Yay us! Just pre-ordered. Looking forward to receiving it!! Ahhhh! I’m so excited for this!! I’ve been waiting for this news since I bought your last book and devoured its contents! Could not be more excited for this cookbook. When I saw the email I was so happy. I have been following the blog for so long dn can remember purchasing the first one. That book has been such a staple in incorporating plant based food into my family’s life. I am most excited to see how sweet potatoes can be chocolate. Can’t wait!!!! Can you post a table of contents? Would be nice to know what’s in the book – sounds amazing!! Pre-ordered this based on those lasagna noodle roll up thingies alone. Can’t wait! This is the best news! I can not wait! Finding out you have a new cookbook coming out was the highlight of my day! This week, my meal plan had 5 nights in a row of Love and Lemons recipes, a mix of blog and first cookbook. Already preordered! Congratulation on the new book!! The first one was great, I bet this one will be amazing too! I love your recipes so much! This is such exciting news! Your first cookbook is one of my absolute favorites and I’m so excited to hear about the new one! Hooray! This sounds amazing. I can’t wait to see it in person ! Click Here to watch youtube video. I love your blog… healthy and yummy food recipes.